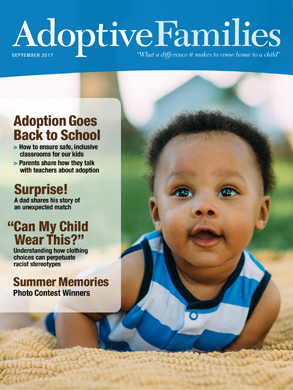 Readers share feedback about articles published in the September 2017 issue of Adoptive Families magazine. We have been foster parents for almost two years and are looking forward to our final adoption date next week! I am a school custodian and the staff and all the teachers have been wonderful about helping us in so many ways. As a Black parent, I don’t put my children in monkey or watermelon clothing. People already say and engage in so many microaggressions, I don’t need my children to do anything that might bring more negative attention to them. They are happy, confident little beings and I aim to keep it that way as long as I can. As the author stated, sadly, the world isn’t colorblind, and raising a transracial family as such does your kids a disservice. Discussing the fact that watermelons hold racist connotations against Black people isn’t race baiting; this is something white people are lucky they never have to worry about when they dress white kids. YOU may think watermelons and monkeys are harmless, but your kid becomes a target for prejudice if you choose to dress them in something with those symbols. There are plenty of other fruits and animals to choose from that don’t directly or indirectly harm your child. The Black community has strong feelings about these images and those feelings are valid and deserve respect. I’ve seen a lot of people comment on this article saying it’s “not a big deal” or who have likened discussing why watermelons on clothing are harmful for Black children to “race baiting.” I’m thinking these people were not required to attend workshops or complete trainings or read a book about transracial adoption before adopting. This isn’t new or news and it’s certainly not race baiting. Transracial adoption requires an extra layer of consideration around such matters. Even if you do let your kid wear a shirt with a watermelon, the point is you talk about the history, that you have an ongoing conversation so that, as an adult, he knows more about the world in which he lives. Talking about this doesn’t cause racism—racism has been there all along. I can’t tell you how many memes I saw of President Obama as a monkey, with watermelons. Just this week Black college students at a large university found bananas on their door handles. So, someone still believes these racist stereotypes…they are not gone completely. Why are so many parents not getting it? This is not about not letting your kid wear something they want; it’s about the fact that your kid will face racism, and yet you’re planning on just ignoring it because you can. Because you think somehow that your denial will erase the fact that your kids won’t have the luxury of that denial. Lovely story about a “surprise” adoption! I always dreamed of the moment I show my husband two lines…. Now I dream of the phone call! So beautiful. What an awesome family and a cool story. I agree that a three-year-old isn’t old or mature enough to make family decisions like adopting a second child. Tell her that such a thing is an adult decision and you, as the adult(s), have decided that you want to focus your attention on your only child—her. If my only child were asking for a sibling, I’d just tell her that families come in all shapes and sizes, and that “our family is a family of three.” You don’t owe a child an explanation about adult decisions/situations that she cannot comprehend. I’m sure this teen has room in his heart for both parents. He has a right to get to know his birth mom and to explore his biological roots. I believe the parent who asked this question should have an open and calm discussion about why he didn’t feel he could come to her, and then ask what she can do to help him process—and know that the answer might be to give him space to figure it out alone. Then, I hope she can open herself up to getting to know her son’s birth mother, too. I’ve gotten to know my daughter’s first mom through Facebook and it is good for my daughter to see. This is such an “it depends” situation. Barring any safety issues for placement, as is the case in some adoptions but not all, I’d take a step back and ask “Why am I upset?” As parents, we have to understand that, when a teen or adult adoptee and his or her birth mother make contact, it isn’t really about us. This is about the adoptee’s natural curiosity about where he came from. Lots of kids hide this as they feel bad for their adoptive parents. Making this child feel guilty for exploring this could very likely backfire. The fact of the matter is that an adoptee can be happy and secure in his adoptive home and still be curious about his biological family. And Facebook makes it so easy. I snoop on people sometimes there, who doesn’t? Maybe their finding each other was innocent. ON THE COVER: Zoey (3, U.S.), daughter of Kristine and Adam, Missouri. Photograph by Kristin Pond, of Pond Photography.